DuckTales was my favorite show growing up; I used to come home after school to get lost in the tales of Duckberg. In fact, Ducktales the video game for the NES was the first video game that I beat. So when the announcement that Ducktales was coming back I was excited, something I could share with my nephew’s something I loved. Even with the terrible reboots, I knew for DuckTales to come back it would be done right. Then the announcement that DuckTales comics were coming piqued my interest. Then the announcement that Joe Caramanga was writing I knew DuckTales was in good hands. 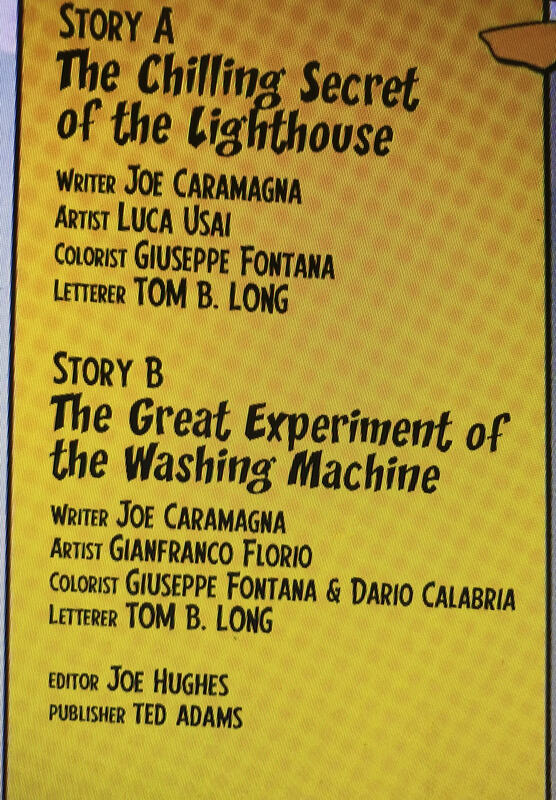 The Chilling Secret of the Lighthouse finds Donald and the boys helping to fix a lighthouse. The Legend is the lighthouse is that long ago Captain Spirula the laziest most boring explorer built the lighthouse for when the Rivers rise but they never did. Donald sticks Louie, Huey, and Dewey in a room as he works to clean and fix up the lighthouse. The boys get bored, Louie and Dewey go to explore the Lighthouse while Huey stays being to cover for the kids. The Boys Louie and Dewey find a secret room that they think leads to treasure which it does not. Donald Duck finds out the boys are exploring and goes after them. While going after the boys, Donald trips fall breaking the waterpipe blockage creating a flood. Later we see the curator Ms. Von Trap thanks, Donald as it brings visitors to Spirula town. Ms. Von Trap offers Donald to go on an expedition for Spirula’s lost ship which might be in a volcano. In the end, we see Donald Duck get out of Spirula town as fast as he can. The Second story in the comic stars Donald and the boys at the lab The Bombastic Band of Brains. 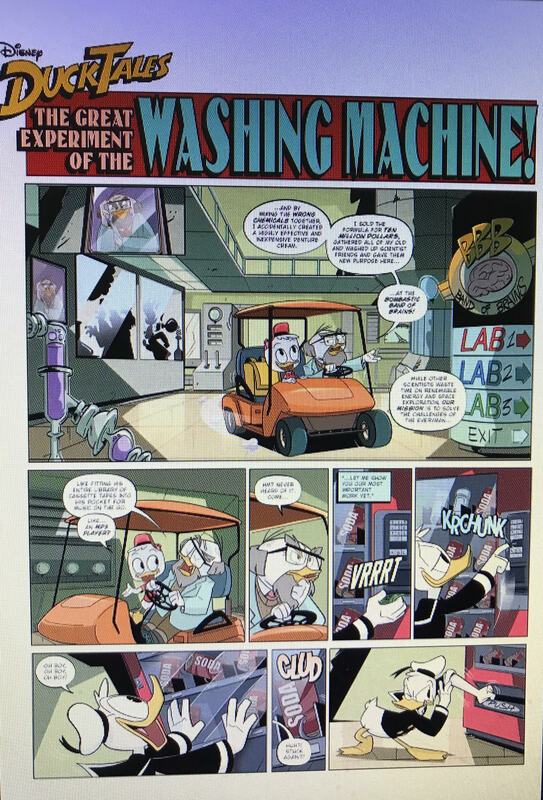 The story opens with Huey on a tour of the lab with Dr. Grinmore. The Bombastic Band of Brains lab is a place where the scientist work to cure to problems of an everyman like Soda Cans getting stuck. Huey wants to explore the lab, but Donald says its dangerous and sends him to Day Care with the rest of the boys. At daycare, the boys are forced to do Bootcamp drills, not liking that the kids escape Daycare, put on scientist costumes and split up running amuck through the lab. Huey is working with the scientist on the washing machine project accidentally turning the washing machine into a super magnet. The Machine was becoming more powerful that it pulled Donald Duck while trying to get a soda can. Donald became a hero as the soda knocked out the magnet. In the end, Donald faints after getting a promotion as head of security. 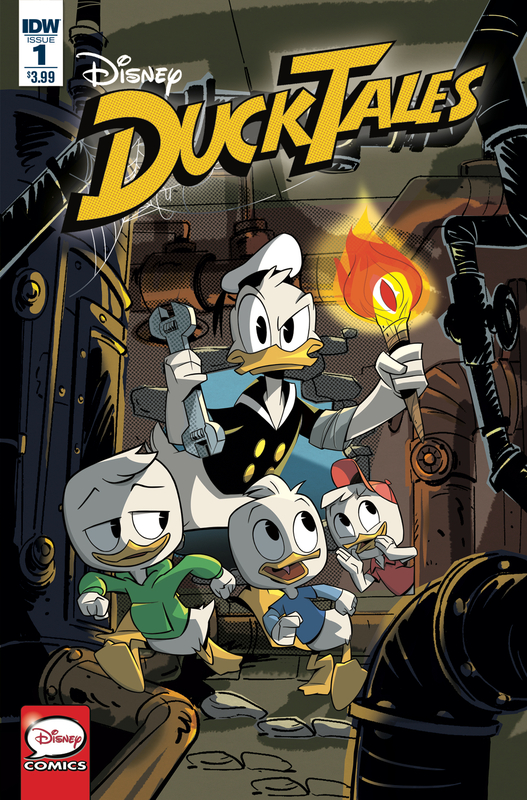 Ducktales #1 is a fun filled action adventure that measures up to the DuckTales stories of old while pushing to new directions. 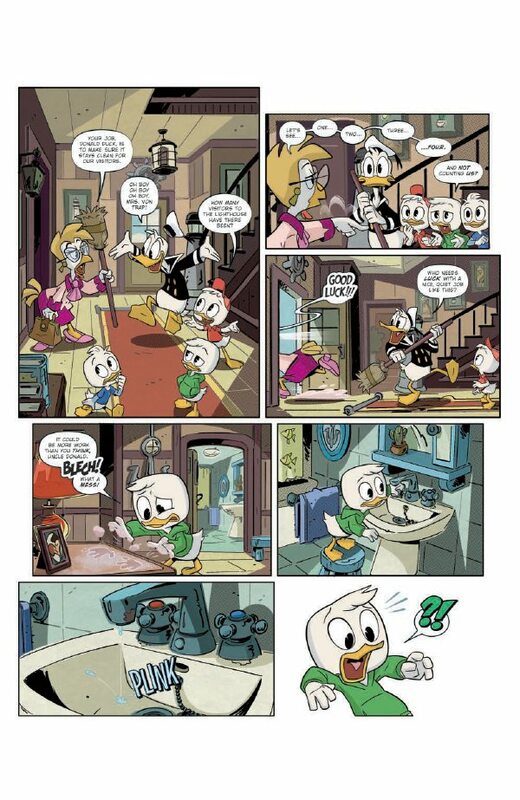 The best thing about the DuckTales comics is that its fun for all ages any age group can read it and enjoy it. The comic brought me back to the days when I would run home to make sure I caught DuckTales on TV. Excellent writing from Joe Caramanga only disappointment no donuts in the issue. The Artwork is stunning and looks just like the characters did on the small screen not an easy task. Everything is quiet, colorful kudos to artists Luca Usai and Gianfranco Florio and colors by Giuseppe Fontana and Dario Calabria. So glad the DuckTales is back a fun, delightful comic for all ages.